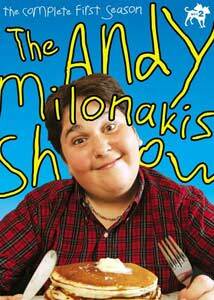 "I got peas on my head but don't call me a pea head..."
Andy Milonakis is pretty hilarious. For those of you who haven't seen his self-titled show, you�re truly missing out. Primarily aired on MTV, Andy Milonakis looks like a young boy (though he's really older than he looks) and he basically just roams around New York, harassing innocent bystanders. His improvised skits around the city are accompanied by overly scripted sketches, featuring Andy, Larry (his neighbor), Rivka (his very old friend), and Ralphie (his "simple" friend). For example, in one of his skits, he goes up to various people, saying, "Thanks for not stabbing me." The reactions he gets are just simply amazing. People give him looks like he is insane, and personally, I can�t blame them. Another classic moment in Andy Milonakis history is the skit entitled The Rap Fairy. Andy wishes and wishes with all his might that he could freestyle like a god, and sure enough, the rap fairy grants his wish. So, Andy roams the business district with a small handheld karaoke machine, rapping to anyone and anything he can find. He even goes so far as to follow a pigeon around. Now that I typed that out, I realize how incredibly stupid it sounds, but it really, truly is funny. Now please excuse my I gots ta get my tree fed. The Andy Milonakis Show is one of the funniest shows I know of right now even though it�s not really clever, it's definitely not intelligent, and it's undeniably stupid. But, there's nothing else like it on television right now. And the best part is, it's appropriate for all ages, at least as far as I'm concerned. Not that I would actually advise it, but you could sit down with a four year old, and they would share most of the laughs with a seventeen year old. The DVD has all the bleeps used when it aired on television, so it isn't like any obscenities have been added. The only complaint I would have about the series is the replay value. What I mean is that if you see one episode you can really never watch it again, since all the jokes are repeated countless times throughout and it kind of ruins the impact. Then again, my friends and I actually have a few skits memorized since we've seen them so many times. Also, you can't really watch a whole marathon because the jokes quickly get old, and you can almost feel your IQ dropping. So don't watch too many back-to-back and you'll be fine. Image Transfer Review: All eight episodes are presented in their original 1.33:1 aspect. The show has a very low-rent feel to it, and the image quality isn't particularly striking. Color levels fluctuate from bit to bit, with the outdoor scenes looking best overall. Not awful, but simply average. Audio Transfer Review: Audio is presented in 2.0 stereo, a more than suitable vehicle for the level of humor. Simple is as simple does, and it pretty much works here, with voice quality clear enough to deliver the gags. Extras Review: The two-disc set comes in a foldout case with a slipcase cover, and the inside flap offers a brief episode summary. There are rambling, giggly commentaries for each episode from Milonakis and his team of goofballs that should appeal to the faithful, with the exception of Episode One, which features a strange commentary from New York Daily News reporter Richard Huff. As an added bonus of sorts, Episode Seven features an optional video commentary of Ralphie trying to consume an entire pizza in 22 minutes. Disc 2 carries the rest of the extras, including Andy Goes to Hollywood (05m:18s), a silly travelogue of the cast on a journey to California. A set of 25 unaired skits runs just over 20 minutes, and a pair of extended scenes run a bit over five. Things continue with some unfunny Ralphie Outtakes (03m:51s), some brief cast interviews, and a set of MTV-related trailers. This is both dumb and funny. It isn't brilliant, but it makes high school kids laugh a lot.